I'll have to try a new formula. I've been trying to bring up-to-date my summaries of meetings of the Representative Assembly of the Confederation of Democratic Simulators. But instead of a "fast forward" I'm stuck as far behind as ever. I'm still reporting on what happened in CDS one year ago! Henceforth I'm only going to present a bare register of topics discussed and decisions taken. The Representative Assembly (RA) meeting held on 28 June 2009 had been mostly devoted to discussion of the latest version of a proposed constitutional amendment concerning merger procedures, presented by Patroklus Murakami. This amendment received four "yes" votes out of the five RA members present, but two RA members had requested 7-day votes. It turns out that those two RA members voted no, and the proposal therefore failed, since a constitutional amendment requires a two-thirds majority. The July 12 meeting was the last RA of the Spring semester of 2009. The agenda was ambitious. Soro Dagostino, the Leader of the Representative Assembly (LRA) arrived an hour late, and on the forums the transcript is in two parts. 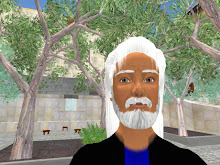 The first part was recorded by Brian Livingston and runs up until he left the meeting, while the second part starts from when Soro arrived and runs to the end of the meeting. The Chancellor's report was tabled, since Jamie Palisades was absent. Discussion moved to the next item, the General Master Plan (GMP). Sonja Strom reported on a workgroup formed a few months before, which had put a lot of work into making various maps. But the GMP had not yet been revised accordingly. Brian Livinston noted that the last forum thread on this topic mentioned work still to be completed regarding terrain. There followed discussion of the incorporation of Al Andalus into the GMP process. Sonja noted that AA had indicated in their merger offer acceptance letter that they chose option 2 for the position of AA, which joined the AA sim with the libraries on it to the north side of Colonia Nova. Brian moved to consult with the New Guild regarding the status of the GMP and the position of AA in the final plan, and this was approved by a vote. Next on the agenda was CDS Economic Development, but time was running late, so the RA moved to an item which was not on the agenda, but which normally would have come under the time allotted to the Chancellor. Sonja Strom introduced Zaphod Enoch, a member of Munich in SL, who liked Neufriestadt, and who proposed that CDS and Munich-SL have a consulate exchange. The RA members were interested in this idea, but expected the Chancellor to carry it forward, and since he was absent it was tabled. There then should have been discussion of proposals from the Scientific Council (SC), but no SC members were present, so this too was tabled. The final item was interviews with two candidates to the Scientific Council, Delia Lake and Danton Sideways. Candidates are traditionally proposed by the SC and then interviewed by the RA, who must approve them (though if the RA takes no action within a month the candidates automatically become SC members). The RA inhabitually decided to approve the two candidates without interviewing them, and the meeting was adjourned. Thus the Spring semester of the CDS Representative Assembly came to an end, and the election period began for the Fall semester. This was a rather special election, since the pre-merger CDS voted for representatives according to its traditional procedure, while Al Andalus selected its representatives using its own procedure. On June 27 Claude Desmoulins acting as Dean of Scientific Council posted the official candidate list. On July 8 Rose announced that the candidate's debate would be held on July 11. After the debate, the debate transcript was posted on the forum. The Scientific Committee also reviewed the total number of RA members, in order to determine the number of interim representatives to be named by Al Andalus. Counting the dual citizens (those declared in both the old part of CDS and in Al Andalus) twice, as foreseen by the merger bill, the total number of citizens was determined to be 131, of which 71 were counted for the old CDS. Dividing by ten and rounding down gave 7 RA members from the old CDS and 6 RA members to be named by Al Andalus. On July 22 the sims of CDS and Al Andalus physically merged together to form one land mass. Cindy Ecksol as new LRA announced on July 23 that the first RA meeting of the new term would be held on August 2. And on July 25 Claude Desmoulins as SC Dean called for chancellor applications (candidates for the position of Chancellor declare their intention to the SC Dean). The Representative Assembly meeting of 2 August 2009 was the first of the Fall 2009 semester. The agenda was posted here and the transcript can be found here. Then, after a few administrative matters, came the election of Chancellor. The two candidates, Jamie Palisades and Zaphod Enoch, were present to make statements and answer questions. Sonja Strom and Arria Perault voted for Zaphod. Micael Khandr, Robert Galland, Pip Torok and Soro Dagostino voted for Jamie. Carolyn Saarinen abstained on grounds that she did not know the candidates well enough. (Cindy does not seem to have voted.) Thus Jamie Palisades was re-elected Chancellor for yet another term. Sudane Erato made a presentation concerning the CDS budget. She spoke about collecting tier on the four original CDS sims. She had no experience yet with Al Andalus, but proposed to budget everything on a monthly basis, even though AA tier is paid every six months. The level of saving to reserves was still set at 25% of the available funds (after payment to Linden Lab). Sudane answered various questions, and Cindy reminded everyone that Jamie as Chancellor was responsible for preparing the budget for the upcoming semester. Under "concerns of RA members," Carolyn Saarinn presented her ideas concerning an in-world status board that would show which CDS RA members were inworld. She also brought up the question of administrative permissions of RA members. Under "citizen concerns," Claude Desmoulins expressed the hope that a new Archivist would be named in order to ensure timely posting of legislation. Then Gwyneth Llewelyn, who had arrived late, was sworn in as RA member, and Jamie was sworn in as Chancellor. Rose Springvale announced the Inaugural Ball planned for August 9th, and the meeting was adjourned.